To ensure that senior citizens do not become a target of such crimes, police have decided to hold a two-day cyber awareness session next week. A few months ago, Delhi Police had arrested six persons for duping senior citizens of Rs 2 crore by promising them a huge bonus on their insurance policies. A month ago, two persons were arrested for stealing money from bank accounts of the elderly. To ensure that senior citizens do not become a target of such crimes, police have decided to hold a two-day cyber awareness session next week. Sources said the Cyber Unit of the Delhi Police Special Cell will hold the session in an auditorium in south Delhi and invite registered senior citizens. Classes will be taken by cyber experts, who will talk about precautions to be taken if they are approached by conmen. Senior officers will also brief them about dos and don’ts when they get calls seeking personal information. According to sources, beat officers have been asked to identify tech-savvy senior citizens in their areas and those who are interested in attending the session. “Victims of such crimes are also invited,” said a police officer. Sources said experts will also talk about the central government’s BHIM (Bharat Interface for Money), a mobile app based on the Unified Payment Interface (UPI) intended to facilitate e-payments directly through banks. 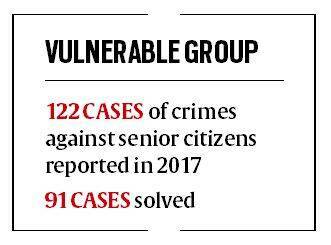 There are around 40,000 senior citizens registered with the Delhi Police. This year, police received 4,481 registrations.